Home > Our School > News > General > Lunchtime Yoga a Success! 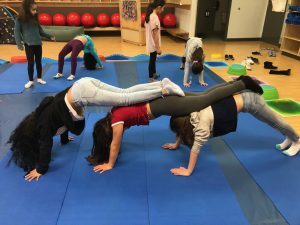 Our students thoroughly enjoyed many mindfulness programs and activities during the month of March; however, the Yoga program was especially successful! Students developed numerous postures, breathing and relaxation exercises. Students also created “I am” bags to remind them just how amazing we all are by writing positive words about ourselves. They also received a few gifts to help them continue on their yoga journey of self love and mindfulness.